Hamas says rocket fire on central Israel was carried out without consent of Arab factions. 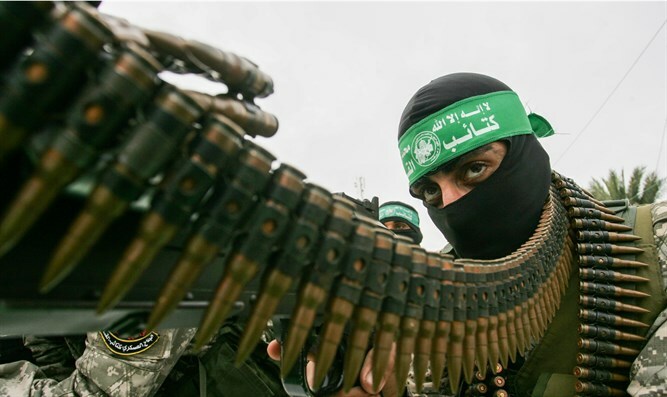 The Hamas-run “interior ministry” in Gaza vowed on Thursday night that it would take action against those responsible for the rocket fire on central Israel, Channel 13 News reports. "The rocket fire was carried out without the consent of the Palestinian factions. The security forces in the Gaza Strip will take measures against those who violated the national consensus," said the ministry, according to the report. Two rockets were fired earlier on Thursday towards the Gush Dan region in central Israel, setting off air raid sirens in the area, including in Tel Aviv. Sources in Gaza confirmed that the rockets were indeed fired from the Gaza Strip, but it is still not clear which organization is behind the rocket fire. Both Hamas and the Islamic Jihad have issued a formal statement claiming that the organizations had nothing to do with the attack. The Hamas military wing added that the rockets were fired during a meeting between Hamas leaders and the Egyptian delegation in an attempt to agree on a truce with Israel. The Egyptian delegation that came to Gaza to promote the truce between Israel and Hamas left the Gaza Strip at Israel's request, but continues to hold intensive talks with the parties in order to try to prevent further escalation. Prime Minister and Minister of Defense Binyamin Netanyahu held security consultations at the Kirya in Tel Aviv following the rocket fire, attended by Chief of Staff Aviv Kochavi, the head of the National Security Council and the head of the Israel Security Agency (Shin Bet). The municipality of Tel Aviv ordered the opening shelters and protected spaces throughout the city. In Rishon Lezion, as well, the mayor decided to open the shelters.